This is one pretty polish. Very Halloween-y. In fact, this swatch is from last Halloween! Notice the super dry skin :( I need to be more consistent with my moisturizing, haha, especially in the fall/winter, even if I am in the South. I like glitter gradients, and this one is a more subtle one, and looks more amazing, in my opinion, because the glitter lays flat. 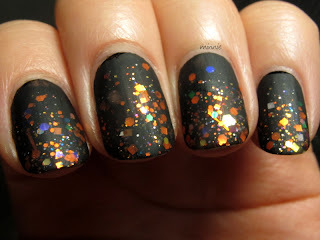 The polish itself is a mishmash of orange, green and whatever else Lynnderella threw in there -- this polish had a disclaimer stating every batch would be different because it would consist of whatever leftover glitters she had. 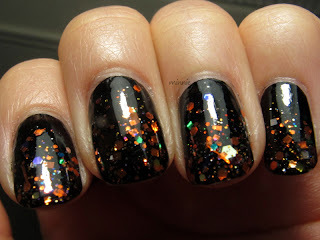 I remember this one garnering a bit of admiration even from those who aren't into polish :) Very pretty! The matte finish makes the glitter pop up! Good choice! in love with the first photo!! love it glossy!! I suppose it's off to Ebay with me! What a lovely nail idea! oh wow..what gorgeous pop!!! love it!! makes me want to go out! Stunning! I can't decide which version I like better- matte or glossy.